What do Marie Curie, Ada Lovelace and Bessie Coleman have in common? If you need another hint, how about what these three have in common with Addy, Caroline and Kaya? Still not sure? All of these are names of dolls. Yes, Curie et al. are also real people, and therein lies the genius of what two young women entrepreneurs are trying to do with a new venture called Miss Possible. They plan on making a line of dolls based on real-life women who have accomplished a lot in the STEM area. The notion is to encourage girls to discover the fun in this technical area by celebrating women of the past who have had ground-breaking roles: Curie in science, Lovelace in computer programming, and Coleman in aviation (she was the first American to receive an international pilot’s license, and the first black woman to barnstorm back in the 1920s). In order to pull this off, you need more than dolls: you need a backstory for the doll, something that American Girl has known about for some time. If you aren’t familiar with this operation, they have stores in major cities around the country where little girls can go in with their moms and end up spending thousands of dollars on matching outfits for the three of them, accessories, and more. They also are the source of the three other names that I mentioned above. Girls can choose a doll based on her story and costume and take it from there. Miss Possible is trying to do something not quite so capital-intensive. Their dolls’ backstories are accomplished with a smartphone app where you can conduct science experiments (Mentos and Coke, anyone? 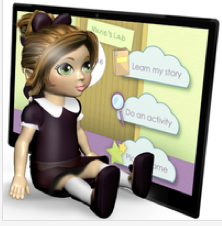 ), learn more about the doll’s namesake, and provide games that the kids can play. Not to mention use different outfits (Curie comes with a lab coat, of course.) It is very ambitious but such a great idea. I wish my daughter and stepdaughter had something like this back in the day when Barbie and Skipper ruled the nursery. The backstory of the entrepreneurs is also interesting: both come from STEM-oriented families and both have pursued careers in STEM at the University of Illinois in Urbana, the home of the real Mosaic Web browser and the fictional creator of the HAL 9000 computer, among many other things. They are still at the idea stage and are looking for funding their company through the crowd. And they are smart about their project: everyone who backs their project, at whatever level, will get to vote on the fourth and presumably subsequent dolls selected. You can read more about what the Miss Possible gals are doing and help fund their IndieGoGo project here. I made my donation, and hope they meet their goals. It is about time our kids had other options to play with dolls.